In December 2017, the month-long Thomas Fire burned over 300,000 acres, devastating parts of Ventura and Santa Barbara Counties in the Goleta Load Pocket (GLP), a 70-mile stretch of California coastline spanning well beyond the Cities of Goleta, Santa Barbara, and Carpinteria, with a single point of connection to the electricity transmission system. On January 9, 2018, in just five minutes, half an inch of rain fell on the fire-scorched and destabilized hillsides, resulting in debris flows of boulders, trees, and over 15 feet of mud in some locations — traveling downhill at 20 miles per hour. The same Southern California Edison (SCE) transmission system that caused the Thomas Fire was adversely affected by it. 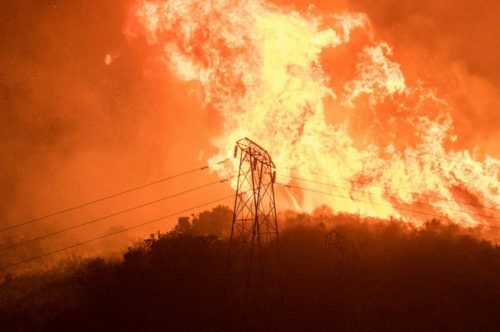 On the first day the fire burned in Ventura County, it damaged the single transmission connection to the entire GLP, which is the portion of Santa Barbara County that is served by SCE, disrupting power service to the GLP for 6 hours — and intermittently over the weeks that followed. Both the disaster and the resulting power outages demonstrate the need for energy resilience in this disaster-prone region. The Goleta Load Pocket is not alone in experiencing disasters like these. Many of the recent California wildfires have been caused by power lines. Around California and across the nation, wildfires, floods, and hurricanes are devastating communities and causing lengthy power outages. Those outages make it harder to cope with the very disasters that cause them. To make matters worse, California’s major utilities, facing lawsuits and even bankruptcy, are threatening to turn off power preemptively during Red Flag events — when fire danger is high — leaving our communities even more vulnerable. Residents of the GLP are all too aware of these risks. 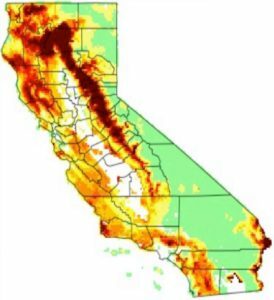 This fire map from the California Public Utilities Commission (CPUC) shows the extreme fire risk in the GLP. 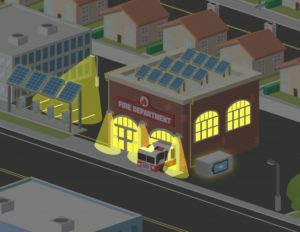 During a power outage, it can be a matter of life and death to keep critical facilities like fire stations, hospitals, and emergency shelters online. Now, most of these facilities rely on polluting and unreliable diesel generators. But most diesel generators have only enough diesel fuel on hand for two days. During an emergency, power may be out for much longer periods, and it may be hard to replenish diesel fuel for those generators if roads are blocked. 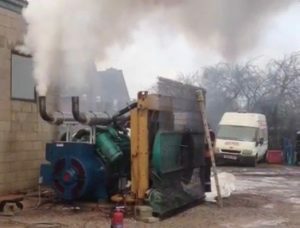 In addition, because diesel generators are dirty and noisy, their siting within urban areas is limited, as are the hours they are allowed to run. We don’t have to accept this status quo. There’s a more effective approach for dealing with power outage risks, one that comes with a host of benefits: Community Microgrids, which are powered by local renewables and enabled by energy storage. Community Microgrids represent a new approach for designing and operating the electric grid to achieve a more sustainable, secure, and cost-effective energy system. Community Microgrids are part of the larger power grid on an everyday basis, but during grid outages, Community Microgrids can “island” critical loads and keep them online indefinitely via renewables-driven backup power and energy storage. Unlike diesel generators, solar+storage Community Microgrids can keep replenishing themselves with sunshine and can store solar energy for use when the sun is not shining. This means that first responders and emergency shelters can keep serving their communities, no matter how long any outage might last. Southern California Edison has identified these transmission lines as being at risk for catastrophic failure from fire, earthquake, and heavy rains, which could cause a crippling, extended blackout of weeks or even months. But there’s a solution to these issues, one that can be implemented now. The GLP has enough siting opportunity for all the solar and storage it needs for indefinite renewables-driven backup power. The area has over 3,000 megawatts (MW) of solar siting potential on built environments like rooftops, parking lots, and parking structures — while the GLP only needs 200 MW of solar and 400 megawatt-hours (MWh) of energy storage for 100% protection against a complete transmission outage (known as an “N-2 event”). It is not unusual to be able to site a significant amount of solar+storage in urban and suburban areas. The Clean Coalition’s Solar Siting Surveys have identified ample commercial-scale solar siting opportunities in a number of urban regions. 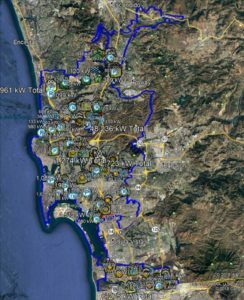 Our San Diego Solar Siting Survey, for example, looked for sites that could host at least 1 MWac of solar. The survey identified enough local solar capacity within the city to fulfill the average power needs of about 500,000 homes during peak solar production hours. With a smaller project size than our survey considered, San Diego would have up to four times as much commercial-scale solar potential within city limits and be able to serve millions of homes and businesses. 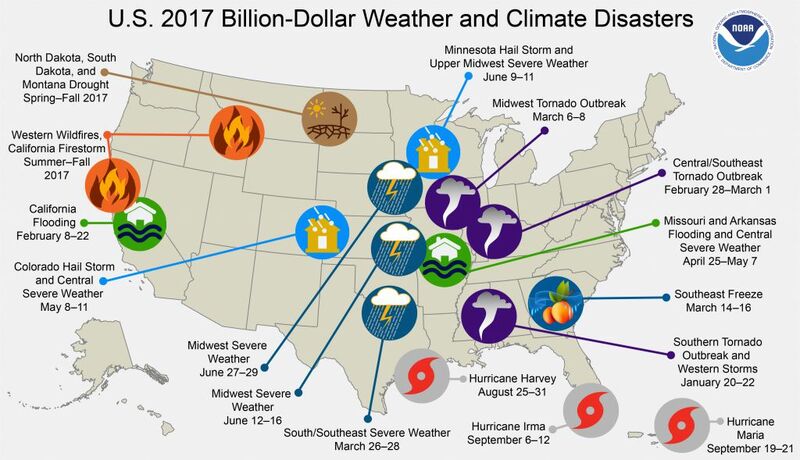 As more areas in California and around the country experience devastating disasters, interest in microgrids is increasing. The California Legislature even passed SB 1339, a bill designed to encourage microgrids that serve critical community facilities throughout the state. But some still consider microgrids too expensive, as highlighted by a largely ill-informed CPUC representative in a recent LA Times article on using microgrids to deal with wildfire threats. 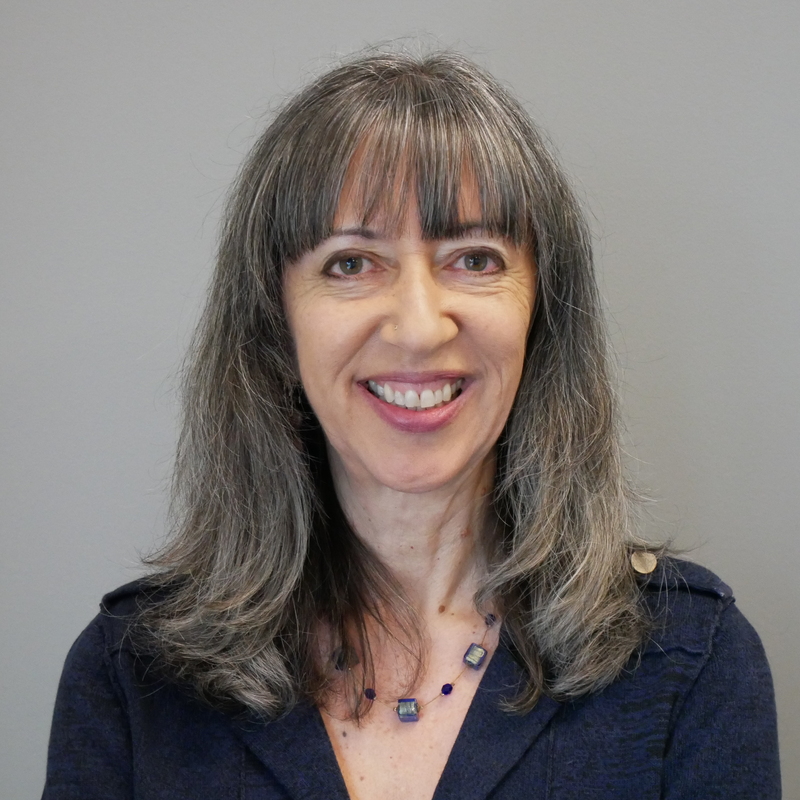 On the contrary, Community Microgrids — microgrids that serve broad grid areas and benefit entire communities, rather than just one building or campus — require cooperation from utilities, which has thus far been mostly lacking. However, this situation is changing rapidly. The Clean Coalition is developing a standard Value of Resilience (VOR) metric to place a basic monetary value on indefinite power backup for critical and priority loads. Community Microgrids are unparalleled in providing energy resilience, and a standardized VOR will help make this obvious to all parties, unleashing the currently incipient market. We’re also designing and staging microgrids that are Community Microgrid–ready so they can be connected to larger Community Microgrids when the utilities are finally ready in the future. The most progressive utilities are starting to support this type of future by ensuring that the proper monitoring, communications, and controls are deployed and ready for future Community Microgrid participation. In the GLP, this work is off to a promising start. The Montecito Fire Protection District has taken the first step toward building a Community Microgrid for its headquarters and fire stations, laying the foundation for a Montecito Community Microgrid in the GLP. 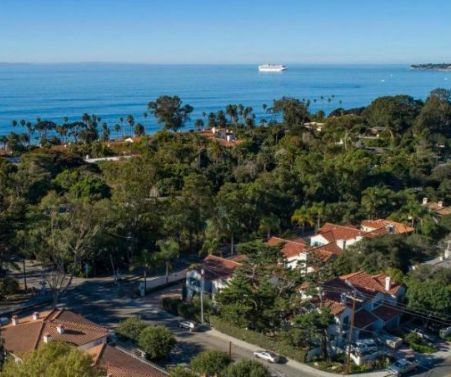 Significant efforts are being made in Montecito and the entire GLP to align appropriate stakeholders — including property owners, policymakers, community leaders, solutions providers, and SCE — toward the goal of a GLP Community Microgrid. The GLP Community Microgrid Initiative provides a unique opportunity to bring resilience to the region, while building back right in areas damaged by wildfires and debris flows. Community Microgrids will showcase the grid of the future, significantly powered by local renewables, and will provide an unparalleled trifecta of economic, environmental, and resilience benefits to the communities they serve.